Over the years I’ve learned that I enjoy my life so much more when I have established routine and order in my daily schedule and in my surroundings. I thrive on routine! Much of that has to do with my personality – I know there are many people who thrive on spontaneity and flexibility. However, I believe that most people benefit from some sort of routine in their daily lives. The question I receive most often is, “Can you tell me how to establish a routine for my current stage of life?” I believe that those people, while they may not be the type who thrive on routine, realize that it’s a helpful tool for days that are naturally less structured. Summer is a very important season for establishing routine! Whether you’re a teacher who has the summer “off,” a working mom of children who will be home all summer, a homeschooling mom who takes the summer off from teaching, a student home from college or anyone else with a different schedule than the other nine months of the year, you can benefit from a summer routine. Here’s how to create one! Write down the basic, essential things you want to accomplish each day. It could be things like walking the dog, making your bed, getting ready for the day or doing a load of laundry. If you run a household, you know that laundry still has to be done during the summer! Work those tasks into a routine that you follow as soon as you get up in the morning – whatever time that might be. Once those things are completed (it might only take you a few minutes), you’re free to enjoy the day without those tasks hanging over your head! My morning routine is very simple, but it makes a big difference in my day. Sit down with your family and create your summer bucket list. Include household projects or fitness goals along with fun activities like travel or making homemade ice cream. 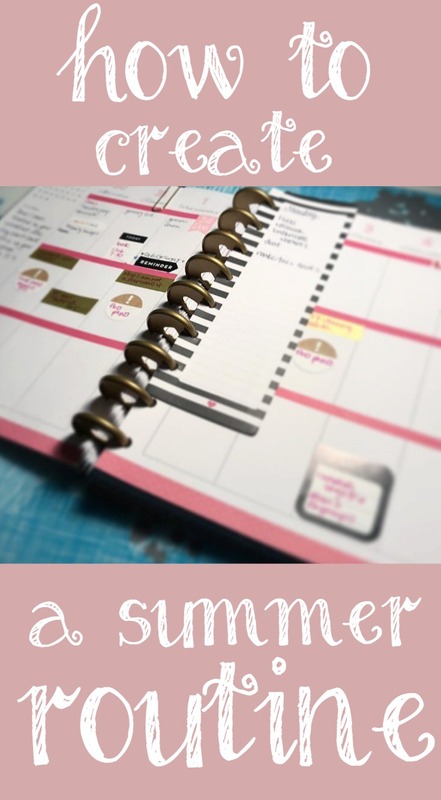 Take your planner and work those items into the summer months. This will keep you from waking up on September 1st and realizing you didn’t really do anything you wanted during the summer! If you have kids at home, post your monthly calendar where everyone can see and anticipate the fun things you have planned. Knowing what days are taken up by big events or projects also helps you take advantage of the slower days you can enjoy at home. I walked through each of these steps in more detail over on YouTube – click here to watch that video! Do you enjoy a different schedule during the summer months? Yes to planning! I just starting putting structure to my nights, which I’ve tended to laze away after the kids go to bed – but I have so much to do! I found a nice weekly list pad at Target that has about 6 spots for every day, and that is working so far. But one thing I did new this year is make a “spring bucket list,” and i think I’ll do the same thing for summer and fall. Basically it includes big activities or accomplishments I want to check off by the end of the season. Yes, better than forgetting them!! I have some of those list pads in my stash, too! They are great for weekly to-do lists. Without a summer routine, I would surely lose my mind with Connor. Little man loves to stay busy. I bet! Hope you all have a super fun summer! From one planner to another, I adore this post. I need to get better about writing things down though. I have been “flying by the seat of my pants” a lot lately.